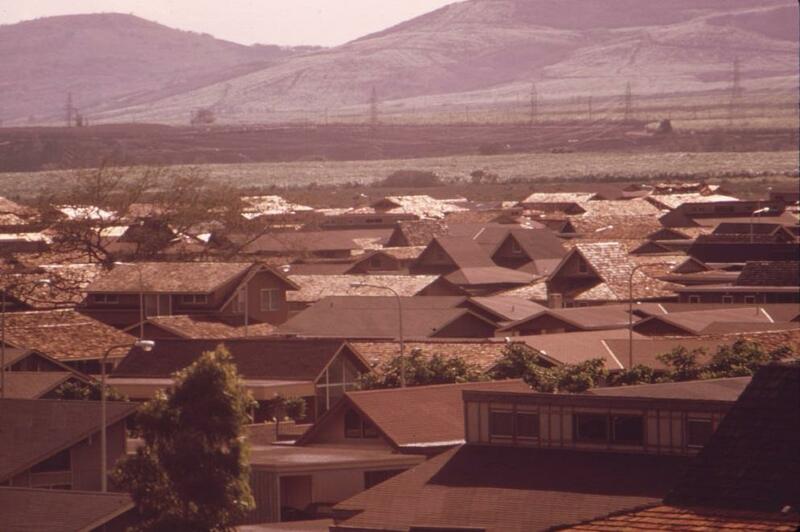 Rezoning of "surplus pineapple land" enabled pineapple growers-turned-developers to build this subdivision in Mililani town, one solution to the island's housing shortage, October 1973. A proposal at the state capitol to address the lack of affordable housing in Hawaii's largest population center has garnered signinifcant community attention in recent weeks. ALOHA Homes, as its known, would offer urban apartments for around $300,000 sold under 99-year leases. It's an idea modeled on a successful public housing program in Singpaore. This week, the Unviersity of Hawaii Economic Research Organization released its analysis of the proposal. In short, it acknowledges the dire need for more and less expensive housing, but is skeptical about the state's ability to produce units for $300,000 or less. The current ALOHA Homes plan would not include a regular subsidy to offset building costs. Sumner La Croix is a reserach fellow with UHERO and the author of Hawaii: 800 Years of Political and Economic Change. He co-authored the UHERO brief on ALOHA Homes. He told HPR that Hawaii's affordabiltiy issues go beyond land scarcity. "We have somewhat onerous regulation of land. If a development project fails at any level of the regulatory process it's dead." According to La Croix, the State of Hawaii was a pioneer in implementing this type of development regulation to protect the environment. That protection has come at the expense of cheap housing. "It's not clear to me that single family homes are ever going to be cheap here. It's not clear on Oahu that we want to cover the isalnd with single family homes. In some sense that would be killing the resource we depend on. But on the other hand we certainly can build up in various areas. " La Croix went on to acknowledge the need for structural reform to local development regulations. "I think what people see today is that we're building up with luxury condominiums and not with more affordable housing. I think there's tweaks to the regulatory mechanism that would help push more affordable housing." The ALOHA Homes bill wouldn't change those regulatory mechanisms, but it does aim to increase the stock of affrodable housing by 6,000 units per year. The proposal appears dead in the 2019 legislative session, but will likely be introduced again next year. Eighty percent of Singapore’s 5.6 million residents live in public housing. A 2-bedroom, 1-bathroom apartment can be purchased on the resale market for around $250,000 U.S. dollars. The island nation’s success in making housing affordable has caught the attention of lawmakers in Hawaiʻi. Officials with the City and County of Honolulu want to build more affordable rental housing. But rather than directly fund construction, they have prepared a package of incentives to make those type of projects more appealing to developers. A homeless community on Oahu’s leeward coast is one step closer to finding homes. The group received a $150,000 donation to help fund a plan to transition the residents of Pu'uhonua o Waianae to permanent housing. The money came from some of the biggest real estate trusts in Hawaii.